Ditch fancy resorts and hotel rooms. Relive your childhood and live in a tree house with the squad. Check out these properties near Pune that let you do so! The Machan is a luxury eco-resort property 1.5 hours away from Pune. Built in Jambulne, one of the 25 biological hotspots in the world, it offers various types of tree house accommodation facilities in the heart of the wilderness. Here, you can explore the jungles by trekking through them during the day and spend the night under a thousand stars. Lohagad Fort, a favourite among trekkers is also situated nearby. Room tariffs start at INR 12,000. The 4-5 hour scenic drive to Dapoli may tire you out but you are sure to be rejuvenated at Amrutes’ Nisarga Sahavas. The property is surrounded by fruit plantations that is plucked fresh and processed into syrups and candies here. The Tree-Hut accommodation is located 25 feet above ground and gives a spectacular view of the hills around. Make sure to sample the authentic Maharashtrian cuisine served here. Accomodation INR 4,000 onwards. 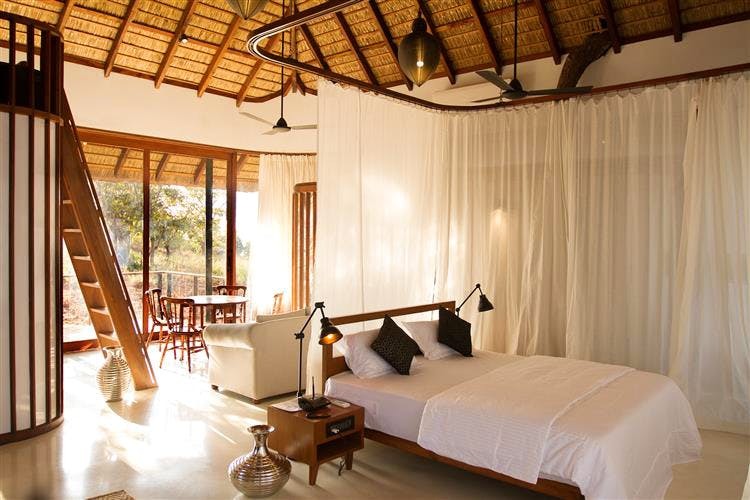 The Tree Hugger room at INR 14,000 per night is built on stilts at the edge of the hill and offers a stunning view of the lush green surroundings. All meals are included in the per night price. Since it is built in a forest near the Tala Caves, you are far removed from the hustle and bustle of daily life. The property is also pet-friendly so you can enjoy your getaway with your furry companion. SO, sit back and watch the sun set over the mountains as you take a dip in the infinity pool. A 7-hour drive from Pune, Hornbill River Resort is situated near the river Kali, where you can go rafting on its rapids. If you’d rather prefer a relaxing stay, check out their natural Jacuzzi or you can even request them for arranging a fishing trip for you. The tree houses lean into the river and are at a height of 40 feet from the ground. Stay awake for the stunning night time view of the moon’s reflection in the water. This is a private property on Airbnb near the small village, Mulshi. It comprises of 3 cottages and is situated around open farmland giving you time to relax and unwind in the lap of nature. Friday and Saturday bookings need a minimum of one night’s stay starting at INR 4780. Book your stay here.